Human IgG antibody is a divalent antibody and the most prevalent antibody in serum accounting for about 10%-20% of plasma protein. An IgG antibody comprises of heavy and light chains. It possesses the basic monomeric "H2L2" structure consisting of 2 Heavy (H) and 2 Light (L) chains. Each H chain is paired with a L chain. The heavy chain components are CH1, CH2, CH3, hinge and the VH and light chains consist of CL and the κ or λ chains. The approximate molecular weight of an IgG antibody is 150kDa. IgG antibody has 4 isotypes – IgG1, IgG2, IgG3 and IgG4. 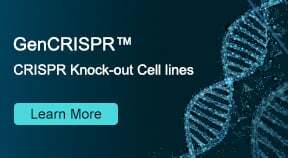 GenScript Production Scientists have the experience in producing a variety of IgG isotypes including human IgG1, human IgG4 and mouse IgG1. To inquire about GenScript antibody production services, visit the MamPower™ Guaranteed recombinant antibody production page. Figure 1: Basic IgG antibody structure: IgG antibody is a Y shaped molecule consisting of 2 heavy (H) chains and 2 light (L) chains folded into constant (C) and variable (V) domains. The Fab domain consists of 2 variable and 2 constant domains with the 2 variable domains making up the variable fragment (Fv). 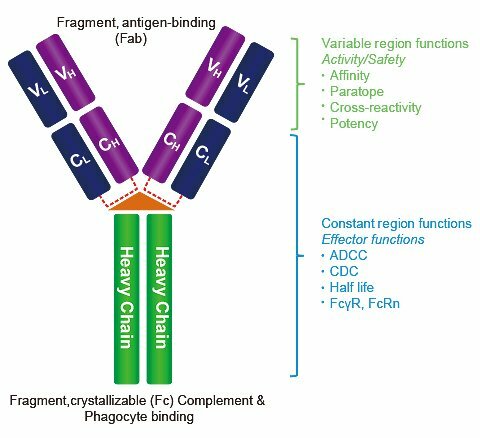 The Fv provides antigen specificity of the Ab with the constant domains providing a structural framework. Each Fv contains 3 hypervariable loops known as Complementarity Determining Regions (CDRs). It is the hyper variability of the CDRs that allow an Ab, in theory, to recognize an unlimited number of Antigens. Approximate L chain amino acid residues are 220 and MW is ~25kDa. Approximate H chain amino acid residues are 455 and MW is ~50kDa. One L&H chain equals ~75kDa, thus full length IgG with both L&H chains is ~150kDa. ½ life of IgG1, IgG2 and IgG4 isotypes ~14-21 days. ½ life of IgG3 ~7 days. Glycosylation sites present at N297 and in the Fab region. Since a vast majority of all therapeutic antibodies employ an IgG1 isotype, it has become the default isotype for many antibody drug candidates. And hence, more is known about the biology and functionality of IgG1 than any other isotype. Human IgG1 antibody is generated as part of a Th1-type response to antigen. The Th1 response is characterized by production of IFN-γ which activates the bactericidal activities of macrophages and induces B cells to make antibodies, which in turn leads to cell-mediated immunity. Human IgG1 antibody can trigger phagocytosis through multiple receptors on monocytes, macrophages and neutrophils (FcγRI, FcγRIIa, FcγRIIIa). The functionality of IgG antibody can be broadly classified into two major categories. 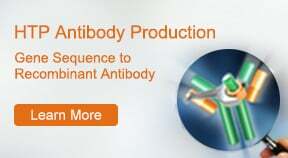 Recombinant antibodies are constructed in vitro using recombinant DNA technology. Antibody genes are isolated from the appropriate source or synthesized based on sequence information. They are then cloned into expression vectors for expression in a suitable expression system. Typically, GenScript scientists use mammalian transient expression system using either HEK293 or CHO cells, to express recombinant antibodies. These cells are easy to handle, have robust growth rates, excellent transfectability and high yield recombinant antibody and protein-generation capacity. After the client provides the antibody sequence, transfection through antibody production can be accomplished in as little as 3 weeks. Protein-A affinity chromatography purified Antibody analyzed by SDS-PAGE (left) and Western Blot of the same panel (right) under reducing and non-reducing conditions. Arrows indicate fully assembled IgG antibody as well as intermediates. GenScript Production Team Scientists have successfully expressed client's antibody in cell culture. LC and HC in pUC57 vector, optimized gene sequence report and purified antibody at listed amount and purity were delivered to the client along with QC data and comprehensive report. GenScript is proud to support your IgG antibody drug discovery research. 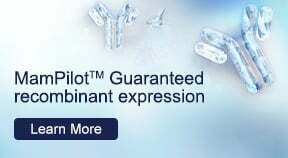 To request a quote for IgG antibody production, either visit the MamPower™ Guaranteed recombinant antibody production page or click the quote button on this page and submit your request. Our Technical Account Manager will be in touch with you to discuss your project. Please see below for a list of other GenScript Antibody Drug Discovery Services. 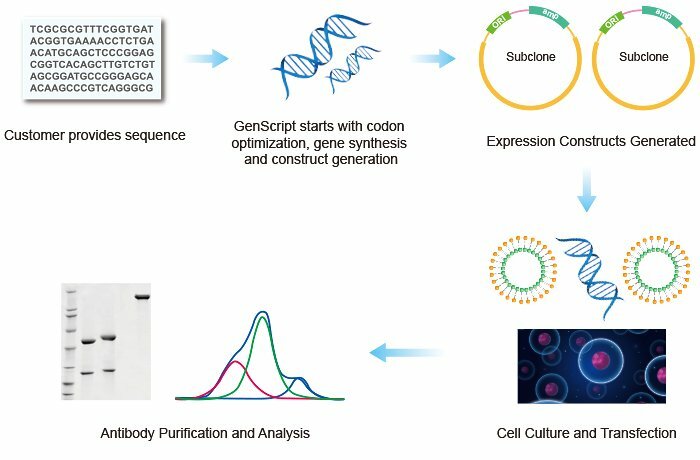 Antibody Discovery: GenScript's Antibody Engineering group can build antibody library with up to 1010 individual clones, to speed up your antibody discovery efforts.